Lt. Gov. Dan Patrick criticized the overnight removal of several Confederate statues from the University of Texas at Austin’s campus while U.S. Sen. Ted Cruz called the decision "the university’s prerogative." Lt. Gov. Dan Patrick criticized the University of Texas at Austin's decision to remove Confederate statues from its campus late Sunday night as sending a “poor message," while U.S. Sen. Ted Cruz said the decision was one for individual universities to make. 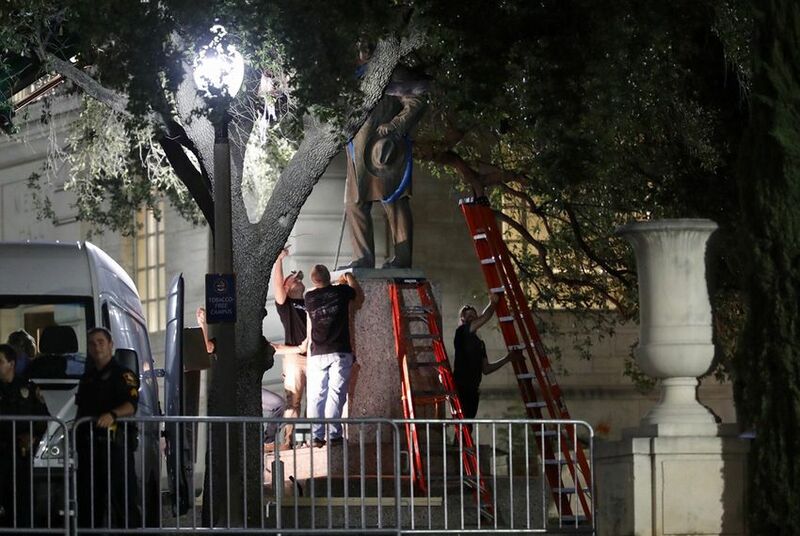 UT-Austin announced around 11 p.m. Sunday night that multiple Confederate statues were in the process of being removed. The surprise decision came about a week after a white nationalist rally protesting the removal of a Confederate statue in Charlottesville, Virginia, turned violent and left one person dead. "These events make it clear, now more than ever, that Confederate monuments have become symbols of modern white supremacy and neo-Nazism," UT-Austin president Gregory Fenves said in an email to the campus community. "Gosh, our universities are supposed to be where we learn about history and not repeat those moments of the past, and there was no discussion here,” he said. Patrick referenced prominent historical figures connected to the Alamo who had been slaveholders, and commented on whether their statues should also be torn down. "What are we going to do with Gettysburg? Are we just going to tear down every statue in Gettysburg?” Patrick asked.“I mean we can go on and on and on and on." "We cannot tolerate the Nazis and the KKK and the white supremacists," Patrick added. "But can we tolerate erasing our history? I think many Americans would say no." Patrick, who serves on the state's preservation board, noted that there are images of the Confederate flag embedded in the Capitol's marble, but that statues “celebrating people in history who were disparaged in the past” have been added. There are several Confederate plaques and memorials on Capitol grounds. U.S. Sen. Ted Cruz, R-Texas, on Monday morning offered neither criticism nor praise of the UT-Austin decision, saying different communities will make different decisions about Confederate monuments. "The University of Texas made a decision yesterday about how and whether to display and acknowledge that history," Cruz told reporters before an event in New Braunfels. "It’s appropriate for each university to make that decision. It was the university’s prerogative to make that decision." Cruz, however, reiterated previous comments that he does not believe it's "beneficial to sanitize our history, to hide our history, even chapters of our history that were not pretty chapters." The statues will be relocated to the Briscoe Center for American History. A statue of former Texas Gov. James Stephen Hogg – also marked for removal — “will be considered for re-installation at another campus site,” Fenves said. UT-Austin spokesman J.B. Bird said the university had no objection to Hogg's statue on campus, but "the entire statuary is one exhibit, so it all goes together." Austin Mayor Steve Adler praised the university's decision, saying in a tweet Monday morning that "putting these statues in a history museum appropriately puts this past where it belongs." Last week, Gov. Greg Abbott said that removing Confederate monuments in Texas "won't erase our nation's past, and it doesn't advance our nation's future" – a sentiment Patrick said he shared Monday. A request for comment to Abbott's office Monday morning was not immediately returned. Disclosure: The University of Texas at Austin and Steve Adler, a former Texas Tribune board chairman, have been financial supporters of The Texas Tribune. A complete list of Tribune donors and sponsors is available here.